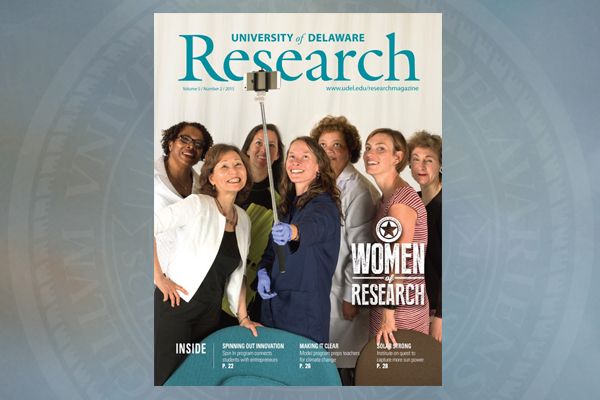 The latest issue of the University of Delaware Research magazine profiles seven women researchers who offer insight into their work, the hurdles they have cleared and what keeps them moving forward. 4:01 p.m., Nov. 12, 2015–The latest issue of the University of Delaware Research magazine profiles seven women researchers who offer insight into their work — from coral reefs to corporations — the hurdles they have cleared and what keeps them moving forward. Each researcher also talks about what inspires her work in a short video in the online edition. Cathy Wu says her father, and especially one of his many letters, inspired her to pursue her master’s and doctoral degrees. That combination of computer science and biology unknowingly positioned her to be a pioneer in a field that uses computer science tools to make sense of massive amounts of biological data. Today, as the Unidel Edward G. Jefferson Chair of Bioinformatics and Computational Biology in the College of Engineering, Wu oversees the Protein Information Resource (PIR) and Universal Protein Resource (UniProt) databases. These tools for identifying protein sequences and interpreting their function are helping scientists worldwide decode human disease, pinpoint desirable traits in plants and much more. Wu was recognized as a Thomson Reuters Highly Cited Researcher in 2014. UD faculty and administrators also talk about activities being developed through the National Science Foundation-funded UD ADVANCE IT (Institutional Transformation) project. Underway since last year, the project is designed to increase the number of women in faculty and leadership positions throughout the University. Fearsome Fridays – the Test Your Knowledge quiz. UD Research is published three times a year through a collaboration of the Research Office and Communications and Public Affairs. To subscribe, visit this webpage. The Carnegie Foundation for the Advancement of Teaching classifies the University of Delaware as a research university with very high research activity, a designation held by fewer than 3 percent of U.S. colleges and universities. UD also is a 2015 recipient of the Carnegie Community Engagement classification in recognition of its deep commitment to public service.